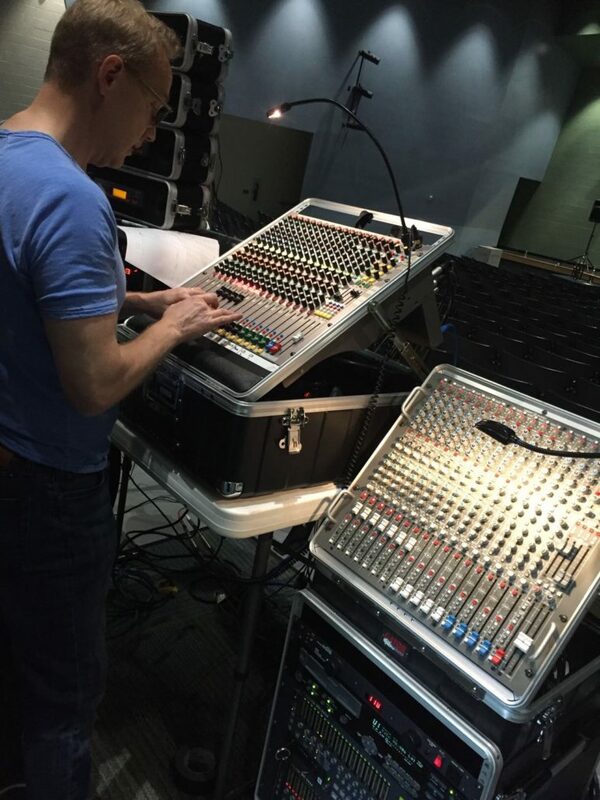 In 2017, I was asked to handle audio for the North Carolina high school show choir state championship. In this competition, performers are accompanied by a track or band. Most of the singers are in constant motion in a space approximately 40 feet wide by 20 feet deep. Soloists share a few handheld wireless mics (4 in this one), but there are no headset mics. Choir blend has to come from strategically placed ensemble mics. If you’re not an audio engineer cowering in the fetal position, let me just say these parameters present some challenges. 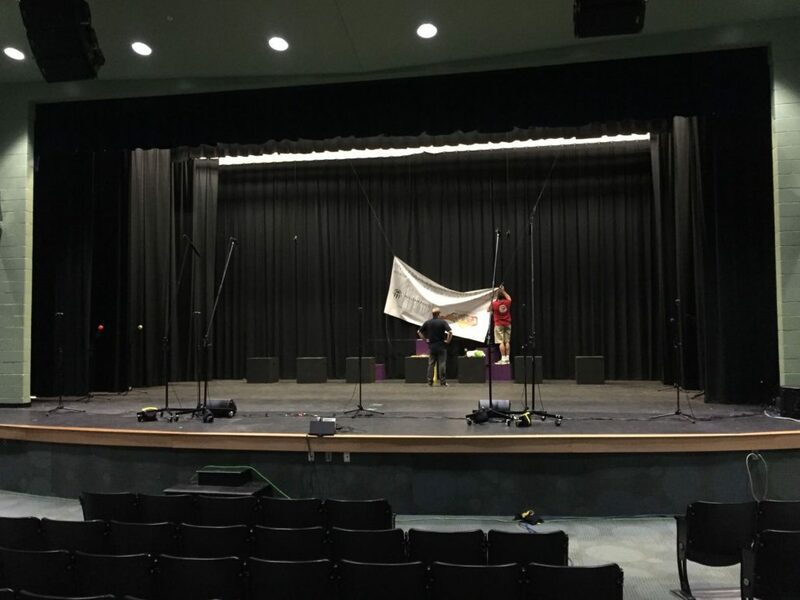 There doesn’t seem to be much about audio for show choir on the internet, so I give you a case study of audio for high school show choir. When mics are amplified through speakers, there’s a risk of feedback (loud ringing) when performers get more than a foot away from the mic. Just a little extra distance from the mic causes the volume to decrease dramatically. There’s actually a formula for this called the Inverse Square Law. Each time the distance between the microphone and sound source is doubled, the sound pressure level at the microphone drops 6 decibels (dB). The audio engineer will usually try to compensate by turning up the mic, which offers more amplification to the weakened sound source. But there’s a point where the microphone becomes sensitive enough to pick up what’s coming out of the house speakers and an oscillation (tone) loop is created. That loop produces the ringing sound called feedback. In this competition, the singers would be moving around a 40’x20′ space, perhaps 10′ away from mics at times. It’s natural to think the best way to pick everyone up would be to hang lots of mics, but that actually makes feedback more likely. There’s a formula for this effect also. Each doubling of the number of open microphones (NOM) reduces the potential acoustic gain (PAG) by 3 dB. Put less technically, the more mics you have open, the less volume you get before there’s feedback. Less is more. You can learn more about NOM from this document prepared by Shure. Wherever mic pickup patterns overlap, dead spots and tonal anomalies are created. This is called phase cancellation and it can be total (no sound) or partial (unpredictable volume dips and funky equalization). More mics means more phase cancellations. To help avoid this, engineers have adopted what’s known as the 3:1 rule. Mics should be no closer than three times the distance to the sound source. So, for example, if the singers need to be picked up from five feet away, the closest the mics would be is 15 feet apart. I checked with a number of microphone manufacturers related to show choir and verified that they all recommend the 3:1 rule. One more challenge is that singers need to hear the track or band well enough to comfortably stay in sync and on pitch. But that means another sound source pumping into the same space where we’re trying to amplify voices from 10′ away. Yikes! I calculated we would probably fare best with two rows of two mics (4 mics total). Two would be all the way downstage, left-center and right-center at the edge of the performance area. They would be placed 15′ apart (each 7.5′ off center) and on tall stands. The other two would also be 15′ apart, but centerstage, left-center and right-center, 10′ from the first two – and hanging from the light rigging. Height of all four was approximately 3′ above the singers head if they stood directly under the mic. I eyeballed it. Mic models would be selected for maximum width of pickup and maximum rear and side rejection. This configuration is certainly not without compromises, but I would say it achieves respectable phase, excellent gain-before-feedback, minimal leakage, nice blend and adequate coverage of the 40’x20′ space. Just to be sure I was thinking correctly, I decided to hit YouTube to see what mics and placement other engineers used in competitions. I did this for many hours over months and found two basic approaches. I’d say 90% were exactly what I came up with. The other 10% used five mics downstage and another 2 to 5 hanging centerstage. To add some spice, one school director was strongly lobbying for the eight mic approach (with Audio Technica AT4033 condensers) because they had designed their show around that placement. Meanwhile, the head of the state competition was gently encouraging a more minimalist approach that favored better sight lines. The solution I came up with was to ask them, and the host school director, if I could set up mic combos, side-by-side, and let us all compare during a rehearsal the night before. They would pick whatever they thought sounded the best – without knowing which combo they were listening to; a blind test. It added hours to the setup, so I agreed to pay for all of it. Everyone was onboard, so I went about designing a show choir mic shootout! I actually came up with three combos. Instead of five AT4033 condensers across the front, I went with Neumann KM 184 small diaphragm condensers instead. I’ve compared these two mics previously and the KM 184’s rejected monitor bleed better and offered better gain before feedback. I wanted to give the five mic option the best shot possible, so went with the KM 184s. Audix makes a dandy boom/mic combo for choir. It’s the Audix MB8455-84 MicroBoom with the M1255B hypercardioid mic capsule. At the time of this writing, there’s really only one other decent web article on audio for show choir. 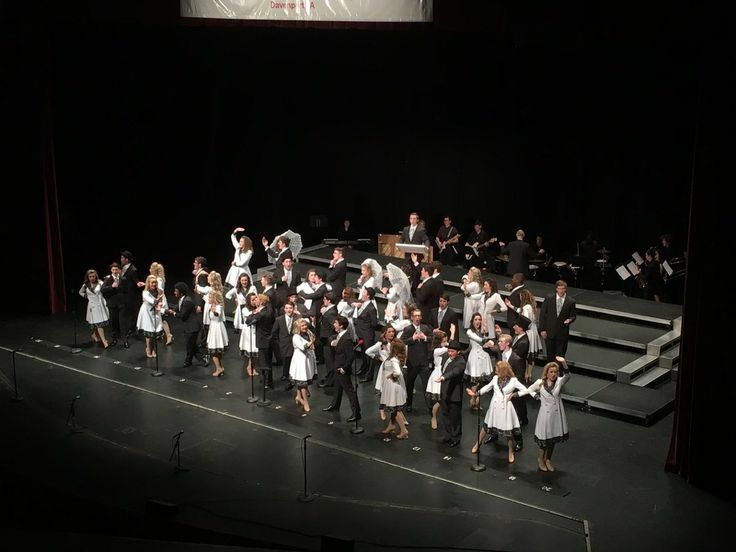 It was published by Productions, a site that specializes in show choir products and news. They had excellent success with this mic. I was prepared to buy a pair, but they were special-order everywhere I looked with a month lead time. There was no way to guarantee they would arrive in time, so I substituted two shotgun mics I already owned to stand-in with a comparable hypercardioid pattern. I used two Audio Technica AT8015’s. One concern I had with the hypercardioid pickup pattern was that there’s a lobe of sensitivity directly off the rear of the mic. They are designed to reject superbly from the side, but not quite as well off the back as a standard cardioid pattern. Rear rejection was going to be important in this venue because the loudspeaker array was mounted out above the edge of the stage. I got to thinking about what kind of mic would offer the greatest rear-rejection (least potential for feedback from the main speakers). The answer to that is a dynamic mic, which would be HIGHLY unconventional on a choir. The Heil Sound PR 30B (B stands for black) has been gaining some notoriety among church audio engineers so I dug in on that one. I calculated a likely 8db volume difference between 2 PR 30s vs 5 KM184s (more if we were using AT4030s). To put that in perspective, a 10db difference is perceived as approximately twice the volume. I was also interested in the Heil Sound PR 30B EQ rise on the high end (like turning up the treble a little). One thing that happens with distance is that highs attenuate a little. I was curious to see if the PR 30s would naturally compensate for that. A few Amazon clicks later, four Heil Sound PR 30Bs were on their way. I figured they would be useful for many other applications even if they didn’t work out for show choir. Spoiler alert: Boy am I glad I did! Since hanging mics is very time consuming and all my research and data suggested the PR 30s would work well, I only hung two PR 30s centerstage. They were on and an untouched-constant when switching between the downstage mic combos in the final shootout. Theory is marvelous, but measuring is better. So I decided to do a mini-shootout at home. I set up a floor monitor aimed into the side/rear of the mic and a main speaker aimed the opposite direction. I used one of each mic, so number of open mics was not a factor here. Each mic was calibrated to just south of feedback with completely flat EQ. Then I recorded singing, claps and shouts into Pro Tools. In all cases, the preamp was a Millennia HV-3D (8 ch version). The console was a Neve 8816 summing mixer and the monitors were Adam S3A’s. My distance from the line of mics was 7 feet. The only control I touched was the preamp gain control to set gain just shy of feedback. The PR 30B does not have a built-in amplifier like a condenser, so I quickly learned it needed far more gain at the preamp. To be forthright, you have to have super clean preamps to get away with these mics on show choir. I decided to use my Millennia HV 3D at the event. Please take note of this as you might get a hissy result if your console preamps aren’t super clean. The result of my pre-shootout was that I got about 4 db more gain before feedback from the PR 30s compared to the Neumann KM 184’s. PR 30B gain before feedback was only a tiny bit better than the AT8015 shotguns. However, the most striking difference was the EQ! The Neumann KM 184s did their job nicely and picked up every nuance of sound waves bouncing off walls. As a result, phase cancellation caused by all the reflections made them sound tubby. Also their volume had to be lower to prevent feedback. The AT8015 shotguns had higher gain before feedback and sounded *better*. They definitely rejected some of the room reflections and monitor bleed better, but I still couldn’t get quite as much gain before feedback. Then I switched to the PR 30s – and wow! They sounded great! There was almost no pickup of room reflections and gain was the highest. It was almost as if I was close-micing, but the mic was 7 feet away. This test is why I selected PR 30s for the centerstage hanging mics. Finally, shootout day arrived! We did an afternoon load-in with rehearsal downbeat scheduled for 6:30 pm. Here are some of the setup particulars. My mixers for the event were a APB DynaSonics ProRack-House and a Crest XR20. The two are able to connect and share common busses and soloing. House EQ was set with pink noise using a DBX DriveRack PA.
EQ was flat for all mics except for an approximately equal amount of bass rolloff (also called a hi-pass filter). The PR 30s were fed through the Millennia preamp. All the others went directly to mixer preamps, which are very clean as long as they don’t have to be cranked all the way up. All mic combos were turned up right to the point of feedback and then backed off slightly. As expected, when doing this for the 5 mics I’d have to go back and reduce volume of the first after the latter ones started coming up. An experienced engineer sent by the “5 mic director” was there to oversee my setup, per our agreement in advance. (Show choir directors are serious!) I was delighted to have him there and he also agreed to be one of the judges. The PR 30s and AT8015s were placed 7.5 feet off center and 15′ apart from each other. They were very close to each other. The five mics were place with one on exact center and the rest spaced at 8′ intervals. Two Ev ZX1-90 passive stage monitors were used with a Crown amp. They were placed right behind the PR 30s and AT8015s. I rotated the tweeters for widest coverage of the stage but least throw into the mics. With mics and choir in position, I rolled the CD track from a Denon 501-C CD player (which I highly recommend for show choir). To keep the mic shootout fair, we had the show choir remain in a fixed position. They were spread out nearly the full width of the stage and in a couple rows, averaging around 7-12 feet back from the downstage mics. The mic shootout panel of judges sat in the back of the auditorium, in the exact seats where the event judges would sit the next day. They were not able to see the console because of equipment racks obstructing their line of sight, but were close enough to hear me easily. The show choir mic shootout results! I cycled through all the mic combos a handful of times until everyone felt like they had reached their decision. They did not discuss their reasoning among themselves prior to revealing their preference. I preferred the loudness of the PR 30s. I also thought the EQ helped the choir voices sit well with the tracks. The AT8015’s sounded great but picked out individual voices a little more and didn’t offer quite as much gain before feedback. They have a much narrower pickup pattern. I thought the PR 30s gave a better ensemble blend feel. I didn’t reveal my preference to any of the others until they had already shared their opinion. Here’s what the judges had to say. All four of us ranked the 5 mic combo in last place. Compared to the PR 30s and AT8015s, the five Neumann KM 184s had significantly lower volume. It was a deal breaker. Everyone agreed the volume was loudest from the PR 30s. This was a priority observation because I needed as much choir volume as I could get to make some heard over the track. Heidi could hear the volume of the PR 30s was louder, but liked the AT8015s EQ better. By the way, her high school choir ended up winning the state championship the next day, but this was the evening prior to the competition so we didn’t know that yet. Leon liked the volume of the PR 30s. Mike liked the volume of the PR 30s but the clarity of the AT8015s. Ultimately, I EQ’d the PR 30s ever so slightly to more closely match the AT8015s. That gave us the highest volume with close to the preferred EQ, which Heidi could live with. I felt we had a clear winner. All the other mics were struck and I used the Heil Sound PR 30s for the competition. Though I didn’t try them, I can guess the Audix MB8455-84 MicroBoom with the M1255B hypercardioid mic capsule would do a marvelous job and probably look the best. Every mic was recorded to a separate track of a multi-track recorder so I could let you hear also. This is an imperfect way to compare because we don’t have the feedback limitation or influence of loudspeakers in a large space. But this will at least give you a taste of what the shootout revealed. In these files, I only included the downstage choir mics. All files are in MP3 format so they will play on any device. After each event, our audio crew meets to discuss what went wrong or right, with the intent of continually improving. This was the report I sent to the board that runs the competitions in North Carolina. There were a few times directors came to the audio console to request curtain or light changes. We didn’t have radios other than our own, so were not able to help very much. I was wondering if we might work out a way for audio to get one of the radios that it looked like the other support folks were using. Some of the CDs had multiple tracks, but it wasn’t obvious whether they should run continually or stop after each cut. A couple schools didn’t send anyone back to offer guidance and I could not locate instructions in the provided tech notes, printed on the CD or CD sleeve. I guessed. (Correctly. Whew!) But I would much rather be certain. Also, sending someone back to fill in details and nuances benefitted those performances, I think. I noted that some of the soloists lacked clarity because of mic technique. One way to improve clarity would be to have soloists do a super-brief audio check where the mix engineer can advise a mic distance that best showcases each performer’s voice. Shouting might require a different distance than a quiet ballad, for example. Soloists would only need to sing for a couple seconds and I could communicate any distance recommendations via radio. Diction may have also been a factor a couple times. The bands didn’t all wish to set up in the same location on the stage. Also some wanted to move after we had them all set up. I thought it might help to mention a logistics puzzle we bumped into. Since the band requires quite a bit of cable spaghetti, mic stands and assorted boxes – AC power, the snake head, mics, DI boxes and monitors cannot be deployed, plugged in or powered until the instruments are placed. If they then want to move instruments (much) the audio gear must be powered down, unplugged and moved out of the way to permit movement. I’m thinking if we could work toward getting the instruments in place early (risers permitting) and commit not to move them, they would have more sound check time left over. When there is a band, I would recommend opening the curtain and establishing a blend with the choir. In general, drums and bass were too loud on their own. I ended up leaving their spot mics off during the performance, but drums and bass were still dominating the performers via the ensemble mics. Some possible solutions: move the band to the floor in front of the stage (to get them out of the choir mics) and/or have drums play quieter. For the bass, we can just turn the amp down. I can always crank it in the house via the sound system. The trick is to keep them from being louder than the choir in the choir mics. We noticed some performers would loosen the mic stands. This is perfectly normal and we tightened them again between choirs, but I wanted to draw attention to it because sometimes stands are adjusted during a performance and the mic ends up not aimed well for the next soloist. Just raising awareness to see if we can avoid mic-droop. It is necessary for ensemble mics and monitors to remain in a fixed position through the entire day. They are placed by careful measurement based on mathematical formulas and have cables taped down for safety. Also, re-aiming monitors can compromise the feedback threshold, not to mention create a dead zone in the middle of the performers. It’s counterintuitive, but overlapping monitor coverage too much creates zones where the sound waves intersect and cancel. You aim them inward thinking it will help you hear better, but actually it increases cancellations that reduce the volume. The front of the performance area was determined by where the curtain travelled and where the lights were aimed. We all quickly learned it wasn’t obvious to the directors without explanation (Bless Steve’s heart for repeating it all day long). I noticed during my pre-show research that other competitions placed a numbered tape at the official downstage perimeter. There’s an example here and here. I wondered if a tape like this would be self explanatory for everyone at a future event. We’re super cautious to avoid feedback, but there were a couple instances where someone on the platform briefly aimed a wireless mic directly into a stage monitor. Of course, that’s the most reliable way to produce feedback. We could probably eliminate feedback entirely with a pre-competition reminder not to point a wireless mic directly into a monitor. Only two schools asked me to increase monitor levels for them because their singers were on the quiet side. I did it, but only slightly and was reluctant. I wanted to explain why. 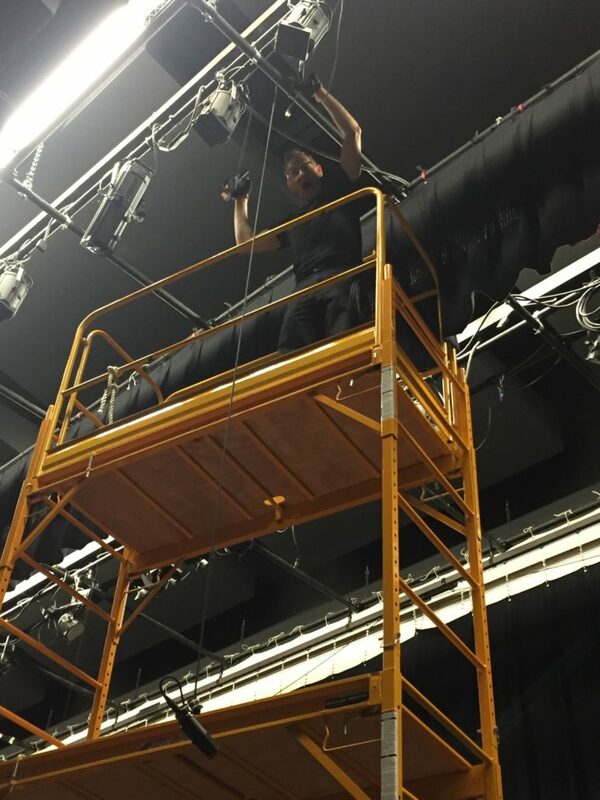 During setup, we sought a monitor balance that would yield a comfortable monitor level without the track being picked up much by the ensemble mics. By turning up the track in the monitors, we made the ensemble mics see more monitor/track than singers. So out in the house, the quiet choir got even quieter compared to the track. There wasn’t anything I could do because the balance at the mics perspective was dominated by track from the monitors instead of singers. Also, phase cancellation from the track getting into the mics can make the track less punchy. Some ways to overcome this problem would be to either have the choir accept the lower monitor level, issue everyone headset mics (different budget and no one has practiced that way) or have the choir sing a little louder. No choir voices in the stage monitors ever! Solos need to be in the monitors, but the risk of feedback is already high. You’ll nuke your volume-before-feedback if you add choir voices to the stage monitors. I put these colored windscreens on the solo mics. Be careful of the brand. I had to try more than one brand due to quality issues with being too thin or color that rubbed off. Bright colors are the easiest to see from a distance. I found it helpful to try to place the mics back in console-order when resetting for each school. I follow a nutrition and lifestyle plan year round that is designed, among other things, for maximum mental focus. This is super handy when you get to choir show number 16 in the late afternoon. It’s important to me to give choir 16 the same focus I gave to choir 1. Brain fog is optional. I can come do an onsite audio class for your choir and give custom feedback specific to your group and performance area. I would very much like to try the Audix MB8455-84 MicroBoom with the M1255B hypercardioid mic capsule in the future. These seem ideal in situations where the loudspeakers are off to the side of the stage since the hypercardioid pattern rejects best from the side. On more traditional choir recordings where they stay still on risers and sing with acoustic instruments, I would go back to standard cardioid pattern condenser mics. But the 3:1 rule still applies.